Bicycle touring’s popularity is on the rise in America. There are no firm statistics available (though Adventure Cycling Association is actively collecting data to help change that), but it’s clear from the number of dedicated websites, blog posts, forums and the fact that nearly all major manufactures have an off-the-shelf touring bike available (certainly not true 10 years ago), more and more people are hitting the road for everything from overnight bike camping to multi-year tours. Unsurprisingly, Oregon seems to be at the forefront of states recognizing the economic potential of the bike touring industry. Oregon tourism website Travel Oregon promotes bike touring. Portland’s Cycle Wild leads guided bike camping trips. Path Less Pedaled is creating a video series about traveling Oregon by bike. And last month, Ellee Thalheimer made her contribution to the state’s burgeoning bike touring industry with the publication of her book Cycling Sojourner, Oregon’s first guide to self-supported, multi-day bike touring. 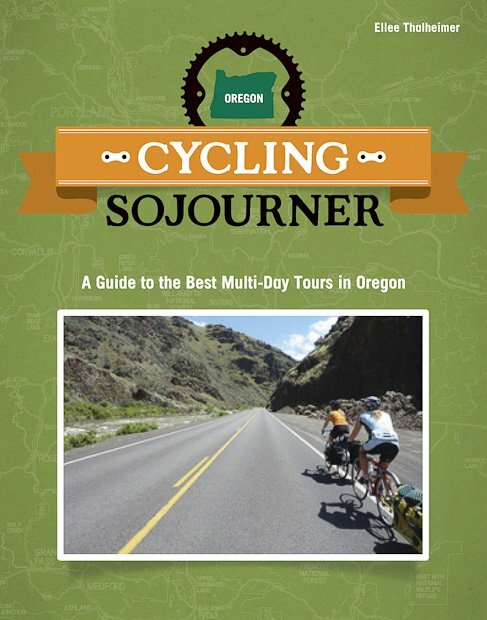 Cycling Sojourner offers its readers an in-depth guide to eight different tours around the state ranging from an easy several day cruise through Oregon wine country to a challenging week-long adventure out east that’s chock full of mountainous gravel climbs. The guide provides all the information one would expect: descriptions of the route, mileage, where to eat, where to find water, where to camp or find lodging. But Thalheimer goes far deeper in her trip details as she shares the first hand knowledge she picked up during the year she spent researching and riding her routes. Each route gets a turn-by-turn cue sheet for every day of the trip, an elevation profile, traffic conditions to expect, potential side trips to take, events and culture in the towns along the way, a list of breweries and brewpubs on route (an essential element for a book about cycling through Oregon), and, perhaps too obvious for an author from Portland, yoga classes one can find along the way. To be fair, Thalheimer is also a part-time yoga instructor. Though it is somewhat difficult to tell exactly how good a guidebook to Oregon bike touring is without actually trying out said tours, it is clear Thalheimer has done her research and never seems to skip out on the details. Each route gets almost 30 pages devoted to it. The chapters are teaming with URLs that provide the reader with most everything they could need while riding. Her tips and tricks range from safety conscious–where to find cell coverage and when to stock up on extra water–to fun and luxurious–where to rent a kayak and how to successfully navigate a wine tasting. The guide is first and foremost for those prepping for or in the midst of one of its tours, but I found it nonetheless enjoyable as someone with no plans to tour Oregon any time soon. Thalheimer was previously a freelance travel writer for the Lonely Planet guidebooks and other publications and wrote Lonely Planet’s Cycling Italy second edition. Her travel writing chops shine when she delves into the history and environment of the towns and areas through which she toured. In the wine country chapter we learn of David Lett, the UC Davis viticulture school graduate who, against all advice from experts, started a vineyard in Oregon and launched the state’s wine industry. In the Hell’s Canyon chapter, Thalheimer discusses the “pika, cougars, badgers, beavers, otters, bobcats, bears, elk, deer, mountain goats and bighorn sheep” that make the canyon forests their home as well as the encroaching impact logging and agriculture have had on the remaining old growth. Given its specificity, Cycling Sojourner is probably not a must-have for every cyclist’s bookshelf. But for those thinking about exploring Oregon’s coast or wine country or old growth forests or alpine deserts or elsewhere, the guide just might be invaluable. This entry was posted in Bike Industry, Bike Touring, Cycling Media, Reviews and tagged bicycle touring, bike touring in oregon, cycling in oregon, cycling sojourner, ellee thalheimer. Bookmark the permalink. I live just up in Washington, this book will be perfect for us as we love to travel in OR. We are off to RAGBRAI here in a couple weeks, that will be our first! Brian Bruns has a great book about that, Rumble Yell http://www.briandavidbruns.com/BDB/Rumble.html, if you know anyone going to that, this is a must have book! I will need a nice easy trip after all this and Oregon looks perfect to me!